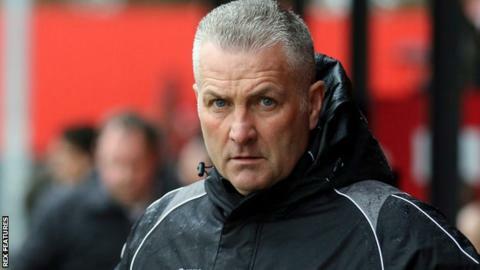 Wrexham manager Gary Mills says the club can reach the National League play-offs if they can win their four remaining league games. Mills' side lost 1-0 to Dover Athletic on Saturday and are six points off the play-off places. Wrexham play struggling Guiseley on Tuesday night before facing Tranmere. "Can we win four football matches? It's as simple as that. If we do then it might be enough but we've got to win them," he told BBC Radio Wales. Following a nine-game unbeaten league run which saw them rise to fourth in the National League table in February, Wrexham have since taken just four points from a possible 12 and slipped to eighth. Mills continued, "We were hoping for a result against Dover which we haven't got but we battle on. There's no point in looking at that game now, we've got to move on to Guiseley." Both Tranmere and Wrexham, who have a game in hand on fifth-placed Rovers, need victory when they face each other on 16 April to boost their hopes of sealing a play-off place. "We'll keep going and hopefully we get three points against Guiseley. They need points, it must be close down the bottom," he added. "We gave ourselves the opportunity, can we do it? Yes we can. Is it going to be tougher now we've lost against Dover? Yes it is, but it's never say die and you never give in."